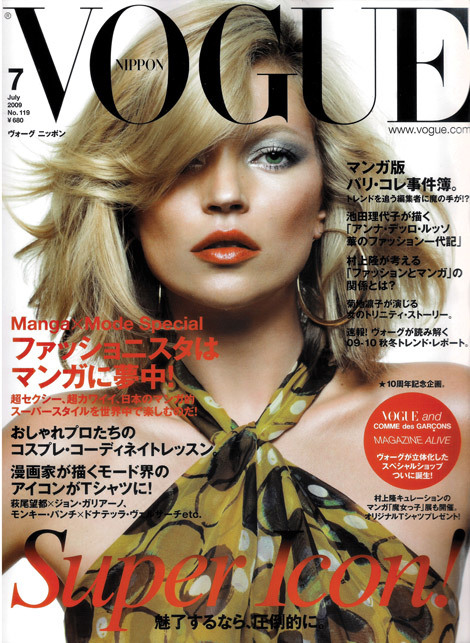 Vogue Nippon almost manages a normal cover for their July 2009 cover. That may be because of super Kate Moss covering this issue. Whatever the reason, it’s a pleasant (normal) sight to see! No, there’s only one Debbie Harry but Kate looks great on this cover. As a real woman her age.She looks beautiful. I often see photos by the paps where she’s au-naturel and careless. Something I like about her. She isn’t always perfect but always beautiful. Hear me, not even a real fan but the truth has to be told! She looks stunning on this cover, but Adrianna is right there is only one Debbie Harry, maybe its an homage? I will say this though Kate gives great face.